An indirect, and unexpected, consequence of the French-Spanish exchanges of 1941 (see article in French), the transfer to Spain of a large part of the Visigoth crowns from the Musée de Cluny (ill. 1) resulted in another case of potential deaccessioning which is well worth telling, for the way in which it reveals the fragile character of our notion of heritage and the threats rising from changing trends and tastes in the history of art. The happy ending makes it all the more exemplary. 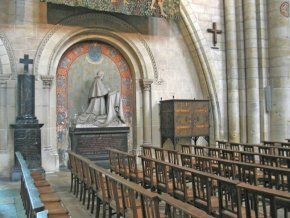 With Prosper Mérimée as an intermediary, an imposing metalic cabinet, a masterpiece of neo-Gothic art, was especially commissioned in 1859 from Eugène Viollet-le-Duc by Edmond Du Sommerard, the curator for the Parisian museum at the hôtel de Cluny (today known as the Musée de Cluny-Musée national du Moyen Age) to welcome the Visigoth crowns from the Guarrazar treasure which the government had just purchased for a high price. A commission, at a considerable sum for such a piece of furniture (6,000 francs), which was produced by Soisson the locksmith, and received in 1860, with the decorative ornaments done in 1863 by the painter and decorator, Alexandre Denuelle (ill. 2), Viollet-le-Duc’s usual collaborator for this type of work. But, having become useless and forgotten after the crowns were returned to Spain in 1941, this cabinet-art object (in 1992 it still showed the labels for the crowns ! ), it fell into anonymity before ending up, no one knows how, at an auction in Paris (Hôtel Drouot, Etude Ader-Tajan, 3 July 1992, n°56, reproduced in the catalogue). The specialists, Olivier Le Fuel and Roland de l’Espée dated it correctly around 1860 and had observed its provenance and use but without mentioning the (magic) name of Viollet-le-Duc. 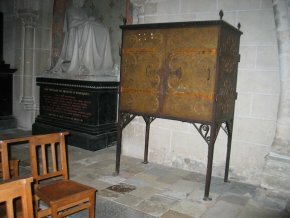 By accident, the Inspection des Monuments historiques after a request from one of its members, Claude d’Anthenaise, had it preempted in order to place it in the treasure room of the Cathedral in Angers, at the time under refurbishment, and where it would still be today if, it had not strangely migrated since 2009 to the nave of the church, alone, unprotected and without the slightest sign providing a description...(ill. 3 and 4). 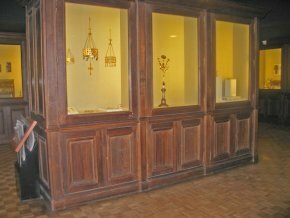 Wishing to act in a thorough manner, the Inspection first consulted the Musée de Cluny which did not show any interest in purchasing (or rather repurchasing !) it. However, the name of Viollet-le-Duc arose in the meantime, thanks to the fortunate research efforts of Clarisse Duclos investigating the history of the Musée de Cluny. 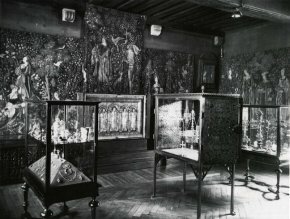 In 1994, the Musée de Cluny even attempted to reach an agreement with the Monuments historiques to recover the display cabinet, but the intended exchange never took place. 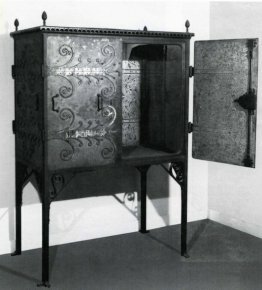 Finally, after a favorable opinion handed down by the Commission supérieure des Monuments historiques (Furniture objects) in June 2006, the cabinet was listed in August 2008.
not sent to Spain, in the left compartment. Concerning the Viollet-le-Duc commission and a fine presentation of this piece of furniture and its stylistic importance, readers should consult Clarisse Duclos’ article, "La vitrine des couronnes de Guarrazar, un meuble oublié de Viollet-le-Duc", La Revue de Louvre et des Musées de France, 1998/1, pp. 82-86, with reproductions, but there is no mention in this study, otherwise remarkable, of either the 1992 auction nor the purchase of the cabinet by the Monuments historiques (its whereabouts in Angers is casually mentioned in passing in note 13, p. 86 : a rather unfathomable procedure !). May we be allowed however to hope that this exceptional piece will one day be granted the attention it deserves, in the name of common sense and historical value, at the Musée de Cluny, which still holds three of the crowns in question, currently exhibited in a display cabinet of massive proportions and unflattering effect ? (ill. 5) Shouldn’t an art work be encased in another art work whenever possible ? What better solution than the one suggested in 1859 by the ever present Viollet-le-Duc ! Unless the object, probably difficult to use again - security reasons will obviously be invoked here - is placed quite logically at Pierrefonds, as we all know the shrine to Viollet-le-Duc’s exploits. We would like to thank here Mr. François Macé de Lépinay, former Conservateur général de l’Inspection des Monuments historiques, Mr. Guy Massin Le Goff and Mr. Etienne Vacquet, curators at the Antiquités et Objets d’art in the Maine-et-Loire region for their useful information.